We love items that are decorative as well as functional! The SEI Campania Wall Mount Wine Storage does just that! Creatively display your wine collection while making use of spare wall space with this convenient, rustic wall mount wine storage. 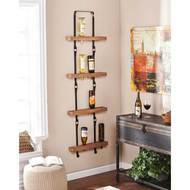 Beautiful fir shelves store wine upside-down by the neck of the bottle and hold up to 16 wine bottles. Optionally use only one to three shelves to make the most out of smaller spaces with the versatile, repeating hanging shelf design.